We all love flowers and while browsing through Pinterest, stumbled upon Floral Jewellery Board and could not wait to create one and pin a few of them. That’s how addictive it can get so we definitely understand your fascination with it. Well floral jewellery has always been there in Indian weddings but the trend picked up staggeringly when Aishwarya Rai wore intricate and fabulous floral jewellery on her wedding. Here we have a few images to share as one of our brides wanted the same look of floral jewellery for her Mehndi as Eesha Deol had on her sangeet night. Vidya Balan has also sported them and looked lovely as always. 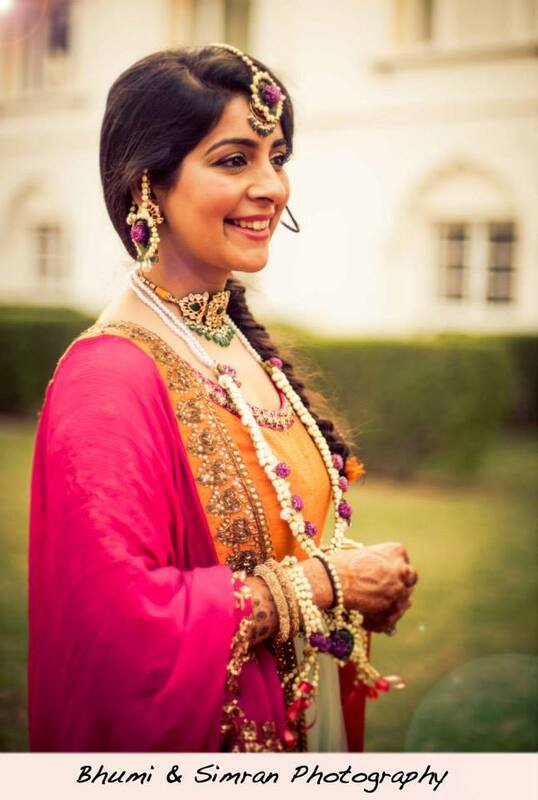 Much recently Meera Rajput adorned sunshine yellow flower jewellery for on her Mehendi evening. Do you also wish to dazzle in fragrant flower jewellery on your mehendi or may be wedding day? If yes, there are a few things you must know about them. A subtle warning to begin with, you don’t go overboard with the flower jewellery because trust us you don’t want to look like a gardener on your special day. Play it cool and chic. Secondly, floral jewellery needs quite a lot of effort and very skilled labour. You might want to tell your florist way in advance so as to he can prepare them well. 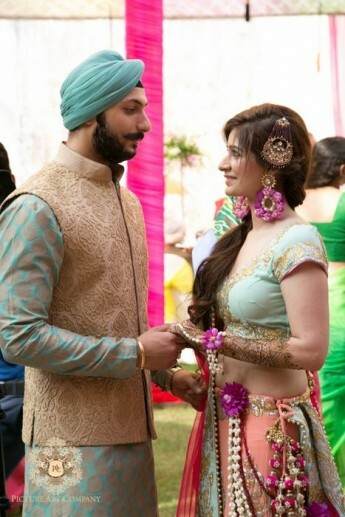 We always tell our florist to get jaimalas and floral Jewellery ready a night before to avoid any last minute jitter. You must be really careful while wearing them, they are like a pearl necklace, if one will fall will apart, all of it will. 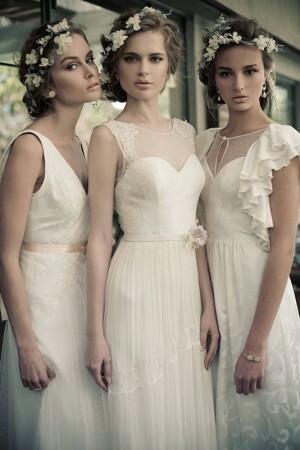 And maybe you could add a few pearls to give it more refined look. 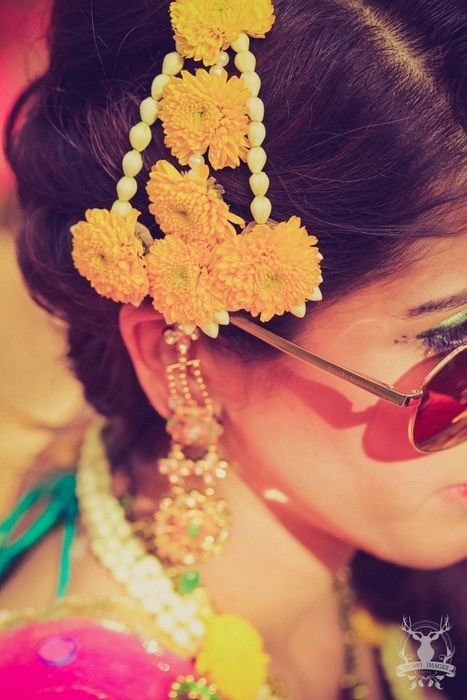 Most commonly, brides prefer to wear them on the mehndi evening. As it is a more fun and casual affair. With so many Indian colours around, heena on your hands, only thing needed to accentuate is floral jewellery. You can get mang tikka, hand bracelets, necklaces, ear-rings, anklets, baaju band and even a kamarband. And the best thing is you can play with colours in them. We think it is best to keep it simple with white mogra or rajnigandha and use rose petals or marigold petals to throw colour in them, you can also use orchids. And of course it must colour coordinate with your outfit. We feel it should be used as a pop of contrast as opposed to the same synchronised colour tones. All you need is your imagination and the skill of florist to look beautiful in your personalised floral jewellery.